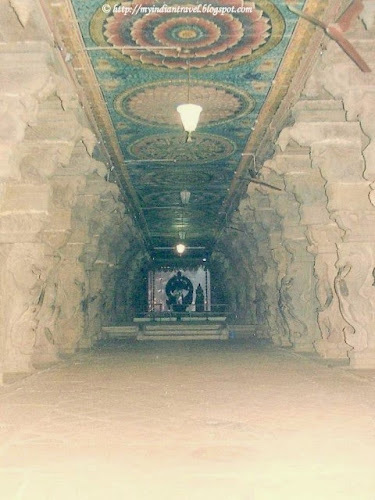 The Hall of Thousand Pillars at Meenakshi Temple of Madurai is on the north side Sundareswarar flag staff hall. This beautiful hall is a sculptural marvel. The hall was built by Ariyanatha Mudaliar in 1569 is an architectural and engineering marvel. It contains 985 carved pillars and each one outdoes the other. There are also few Musical Pillars in this hall and each pillar produces a unique musical note. 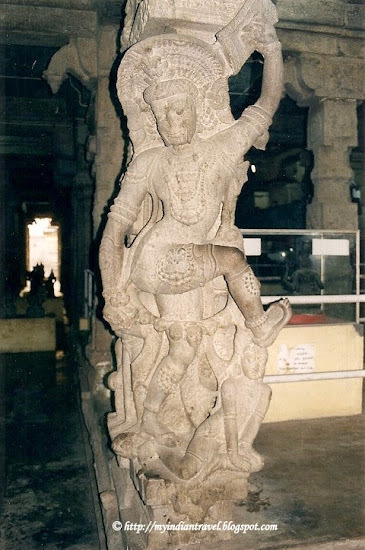 Each pillar in the hall is a carved monument of the Dravidian sculpture. The more prominent among the carved figures are those of Rati, Karthikeya, Yali, Shiva. This hall also serves as a Temple Art Museum and there are icons, photographs, drawings. 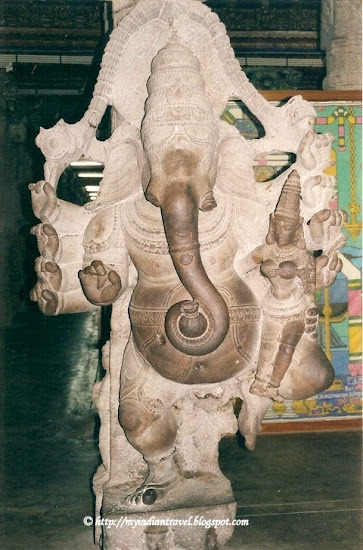 I liked the huge sculpture of Ganesha on the pillar very much. Very nice Hall, marvellous sculptures! It's another wow of a post Rajesh! I think it's the sheer scale of things in India that always amazes me, to think there are nearly 1000 pillars, wow, wow, wow! Beautiful photos as always, Rajeesh! Hope you have a great week! That is unbelievable! Amazing. 1,000 sculptured pillars! Such fantastic detail! Thank you for sharing this wonderful world of sculptural. Amazing place, the sculptures are pretty. Great shots, enjoy your week! What an incredible place, Rajesh!! Wonderful captures as always!! Hope you have a great new week!! Goodness the hall is amazing. Awesome 1st photo! Great perspective and lovely statue shots also! I also like the Ganesha pillar! Amazing temple! Wow! That hall is spectacular. Beautiful pictures, I like Ganesha ! That ceiling is a stunning work of art....I have never heard of a Musical Pillar. What a treat to hear them. The carved pillars in this temple are fascinating. The detail is amazing -- and beautiful. Always amazing to see the ornate archicture. Delicious photos, thank you very much for showing us these beautiful sculptures! That is a marvel indeed - so many exquisite pillars. Yes, the pillars do make a unique note. I have heard it!!! Awesome photos and those sculptures are amazing. Thanks for the share and have a great weekend. Excellent capture on the sculptures... marvelous quite! Beautiful picture. Hall came out really nice with colors becoming very clear. Good Article with valuable info. Photos are really good. Being an Indian Traveler ,i really like to explore these places. Thanks for sharing.